JooTube.TV: "Families of Lone Soldiers" shows volunteers' advocacy at I.A.C. 's Celebrate Israel Festival in L.A.
"Families of Lone Soldiers" shows volunteers' advocacy at I.A.C. 's Celebrate Israel Festival in L.A.
A British-Jewish veteran volunteer in the Israeli Air Force, Dr. Jason Fenton, discusses the history of overseas volunteers in Israel's defense, beginning with her Independence War. Recorded at the Israel Independence Day Fair in Los Angeles, 2012 (today known as Celebrate Israel Festival). In 1967, in anticipation of the Six-Day War, world Jewry sent thousands of Zionistic volunteers to Israel, that the Jewish Agency hoped to immigrate. Some did immigrate, while since that time, many Israelis emigrated. Still today, a number of army-age teens Israelis from those families, along with diaspora-Jewish families, elect to enlist to serve in the Israel Defense Forces. Because they haven't local family support in Israel for weekends, holidays, or "leave time," they are known as Lone Soldiers The overseas enlistees comprise about 45% of the 6,300 I.D.F. 's total lone soldiers. A support group was founded to serve as a liason between the service-members, their families back home, and the I.D.F. Pictured (l to r) at their booth at the Celebrate Israel Festival in L.A.: co-founders/c0-chairs Eli Fitlovitz and Dr. Lawrence Platt; philanthropic supporters Sheldon and Dr. Miriam Adelson; Evie and Stuart Steinberg, parents who lost their son, Max, as a Lone Soldier in the I.D.F. The Families of Lone Soldiers' group was founded in Los Angeles, as a result of the number of families from here whose children elect to serve. The group is now international. Their website describes their association as: "We are families who are united together to support each other while our children are serving or have completed their service in the IDF. It started out by connecting parents with each other and to the state of Israel and the government of Israel while their children are serving as lone soldiers in the IDF as well as to help families obtain resources. We support their families during the time of service and after. Assisting and supporting parents in this challenging time both in the United States and Israel." 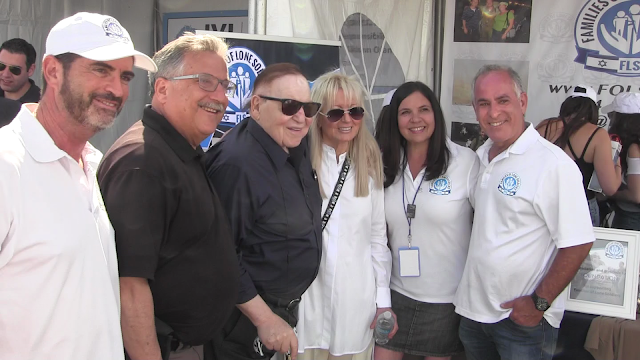 Some of the leaders of the Families of Lone Soldiers' spoke with us at their booth at the Celebrate Israel Festival in Los Angeles. Video (above) includes co-founder/c0-chair Eli Fitlovitz; are co-founder/c0-chair Dr. Lawrence Platt; Stuart Steinberg, the father of Max (a Lone Soldier from L.A. who gave his life for Israel), and Israeli-American philanthropist, Dr. Miriam Adelson, who praised the Friends of Lone Soldiers booth at I.A.C. 's Celebrate Israel Fest as "Great!" Israeli-American veterans of I.D.F. lone soldier enlistment, (pictured left to right) Mr. Adi Lerner, Danielle Tubul, and Sharon Marciano discuss their motivations and attitudes on upheaving their lives to relocate to the Israeli Army. What did they do and learn in the country's national service for young people? Veteran lone soldier, Jonathan ("Yoni") Cohen explains his motivations y he served to protect modern civilization - and what Israel's security means for the world. In video below, Evie and Stuart Steinberg address an L.A. community gathering in memory of late son, Max, at Temple of the Arts at the Saban Theater, August 2014. More info is available on the Families of Lone Soldiers' website.